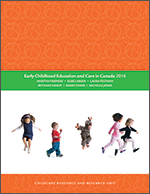 Martha Friendly examines how child care has fared for three years under the Social Union Framework Agreement. This article appeared in the Canadian Journal of Social Policy (2001) Issue 47, p 77-82. Released on International Women's Day in 1986, Status of Women Canada's groundbreaking Report of the Task Force on Child Care, was greeted enthusiastically by feminist groups and non-governmental organizations. The Task Force's key recommendation was a universal system of child care - co-funded by federal and provincial governments with affordable parent fees, designed and managed by the provinces under national standards - to serve all children and families by 2001. At the time, such a child care program seemed not only reasonable, intelligent and necessary but also possible. However, recurrent political commitments and exponential growth in research providing rationales for universal child care and early education have not produced the publicly-funded, high quality system of services the Task Force envisioned. Indeed, the shifts in roles and responsibilities that culminated in the 1999 Social Union Framework Agreement (SUFA) have shaped a political environment in which it seems less possible to achieve a child care system now than it did then. Although the stalemate in public policy extends considerably beyond child care to health, housing and other areas, child care as an essential but not established social program is a good test case for assessing the agreement. As SUFA's three-year trial nears its close, an appraisal of how well child care has fared in the new regime is timely.